Many people in Hong Kong will tell you that the Independent Commission Against Corruption isn’t the feared organisation it once was. Set up 45 years ago by the Colonial Administration, its main goal was to clean up the corruption that was endemic in many government departments. While most would argue that Hong Kong is a much fairer society than it was back in the 1970s, we’re far from declaring victory over corruption, as business interests still collude with each other on a daily basis and many of our government’s big decisions reek of behind-the-scenes influence. The latter became most apparent in 2017 when the ICAC’s operations head was abruptly removed from her post without explanation. It is widely believed that her demotion was tied to a probe she was leading into a massive, undeclared payment that the then chief executive (our version of a mayor) Leung Chun-ying received from the Australian company, UGL. But it’s business as usual at the ICAC in the film P STORM by director David Lam Tak-luk/林德禄. The fourth chapter in the one-lettered series that began in 2014 finds ICAC chief inspector William Luk (Louis Koo/古天樂) sent to jail for drunk driving (which we call “drink driving” here for some reason). All is not as it seems though, we learn early on. Rich bad boy Cao Yuen Yuen (Raymond Lam Fung/林峯), who is in jail for the murder of New Territories landowner and retired shady accountant Law Tak-wing (Lo Hoi-pang/盧海鵬), is due to be released on early parole. Before he’s even out though, his hired thugs pay a call on Law’s granddaughter, Natalie (Chrissie Chau/周秀娜), and threaten to kill her. Why don’t they just kill her, you ask? That is just one of the film’s many plot holes and I’m getting ahead of myself. 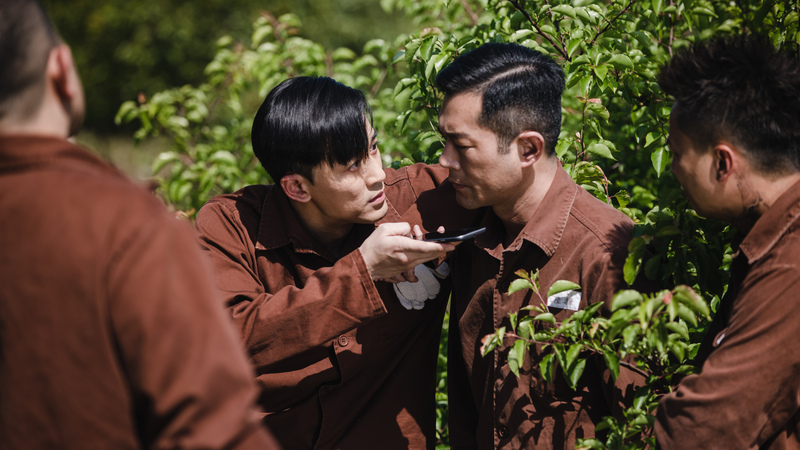 Inspector Luk is convinced that Cao has paid off some key people inside the Correctional Services Department to get his early release so Luk decides to go undercover, of sorts, to investigate. Small problem though. Wong Man-bun (Gordon Lam Ka-tung/林家棟), the disgraced police superintendent whom Luk arrested back in 2014 in Z STORM, is an inmate in that prison too. Oops! Someone didn’t do their homework. Don’t worry if you haven’t seen the other STORM films (Z, S and L) if you plan to see this one. P STORM spends its first few minutes catching the audience up on all the relevant events that brings Chief Inspector Luk to this point. Of course, you may wonder why Luk actually has to drink and drive in order to get thrown in jail. The man has direct access to the new, clean-as-a-whistle, superintendent of police. They could easily have fabricated the scenario without putting Luk or any other driver in danger. Then, of course, there’s the whole issue of Luk’s high profile position. He’s not exactly the ideal person who should be going undercover but, again, let’s not get bogged down in plot holes and unlikely scenarios so soon because there are plenty more that pop up in the film’s shoot-em-up climax involving heavily armed ICAC agents. Like all big-budget Hong Kong (and more than a few Hollywood) films these days, production money comes from China. It’s hardly surprising, then, that P STORM takes great pains to put haloes over the heads of the mainland Chinese law authorities’ and show how they and their Hong Kong counterparts willingly cooperate with each other to catch the bad guys. I’m sure the two agencies do cooperate in real life but in P STORM it seems rather propagandistic, not to mention pandering. At the screening I attended, the scenes of their cross-border meetings were met with more than a few snorts and guffaws from the locals. Ah, but if only those weren’t the only scenes that made people laugh in disbelief. Like its predecessors, P STORM is rife with hard fadeouts that give the film a 1970s made-for-tv styling. The only thing missing are the intertitles or voiceovers that say, “Meanwhile, back at the prison…” and the like. It’s hard to believe that someone is still taking such an old-fashioned approach to filmmaking in 2019, much less that he’s repeatedly getting away with it. The film opened in China last weekend and reportedly took in close to US$40 million, beating SHAZAM! by a hefty US$10 million. That can only mean one thing and it’s already been announced: The fifth film in the series, G STORM, will begin shooting in August for release next year. Clearly, audiences are loving this ridiculous and corny franchise. Yet as flawed as P STORM is, it’s also entertaining, perhaps because of its earnestness or maybe because it’s mercifully short. The performance by Louis Cheung Kai Chung/張繼聰 (ADIEU/告別之前), who plays the film’s comic relief, certainly doesn’t hurt either. If you’re looking for a Hong Kong film to watch, you could do a lot worse than this one. Watch the review recorded on Facebook Live on Friday, April 12th at 8:30 am HK time!